last year, when anthony's closed ... things were bleak around here. (although, seeing as i was a huge pregnant lady throughout the super hot summer, it's probably best it wasn't available to me, as i would have gotten even huger.) anyway, soon after they closed, bánh mì báget moved into their space. it took me this entire time to finally get over there & try some of their grub. since they are the "home of the vietnamese bánh mi sandwich," that's what i had to get. 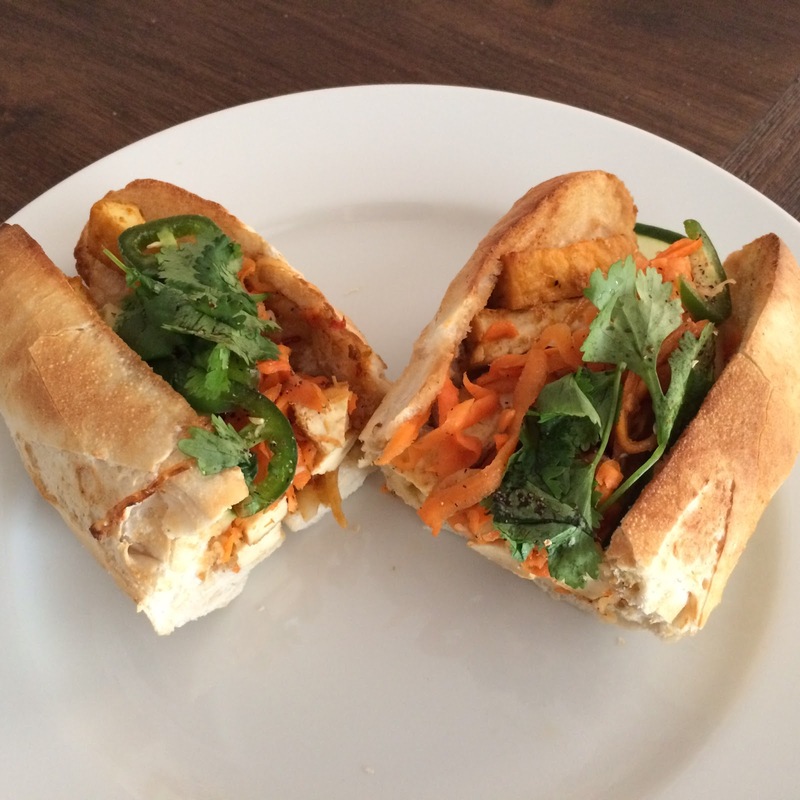 cucumber, pickled carrots, cilantro, vegetarian soy sauce, jalapeño & lemongrass tofu on a fresh baked baguette. guys. this was amazing. since i brought it home, i added some of my own vegan mayo ... which really took this from an a to an a+. rice paper rolls stuffed with rice noodles, mint leaves, tofu, lettuce & bean sprouts & served with fresh peanut sauce. here's where things derailed ... these springrolls were just a no. first off all, they were HUGE. this is a full size dinner plate. what?! second, they contained mushrooms. which were not listed as an ingredient ... and we know how i feel about mushrooms. they were also just generally not very good. luckily, the sandwich made up for it. 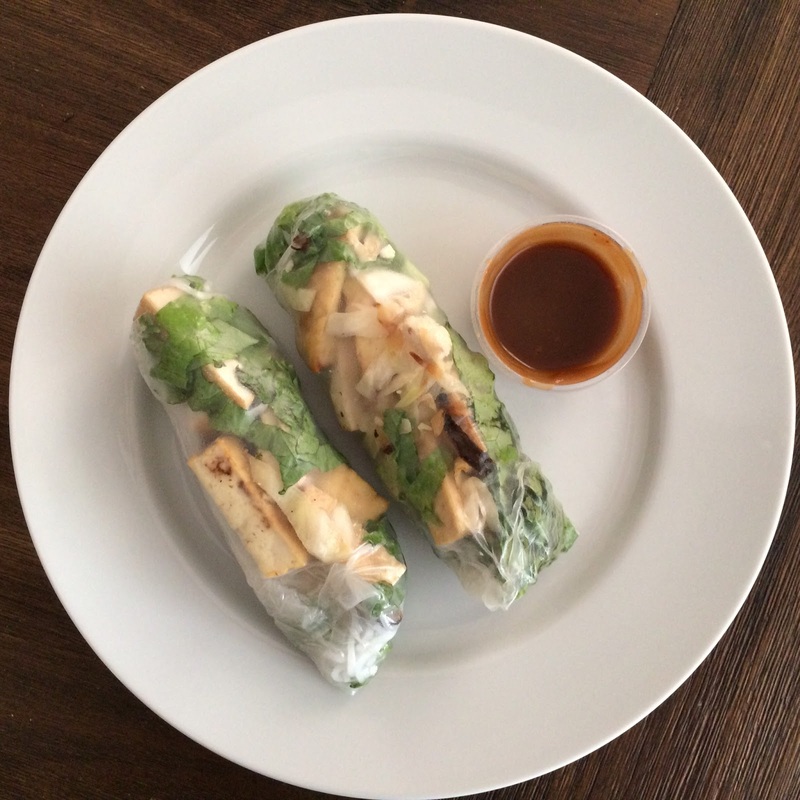 besides upping their springroll game, the only thing that could make bánh mì báget better is if they offered a vegan pho. until then, they've got plenty of other vegan items on their menu i'm excited to try. i'll definitely be back.